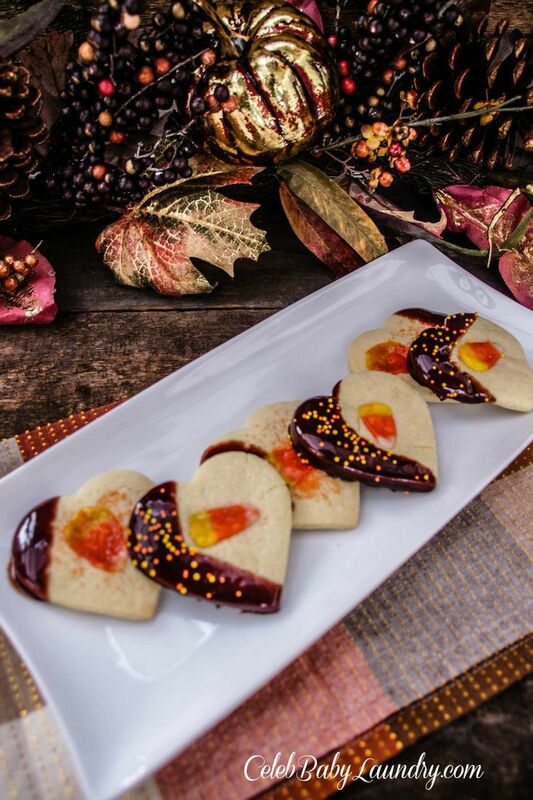 Just in time for fall, these simple sugar cookies are transformed into Homemade Halloween Heart Sugar Cookies with Candy Corn. This recipe begins with a dough that is perfect for kids to experiment with and enjoy creating into whatever their imagination comes up with. 1. In large bowl, whisk flour, baking powder, and salt. With an electric mixer, cream butter and sugar until light and fluffy. Beat in egg and vanilla. With mixer on low, gradually add flour mixture; beat until combined. Divide dough in half; flatten into disks. Wrap each in plastic; freeze until firm, at least 20 minutes, or place in a resealable plastic bag, and freeze up to 3 months (thaw in refrigerator overnight). 2. Preheat oven to 325 degrees. Line baking sheets with parchment. Remove one dough disk; let stand 5 to 10 minutes. Roll out 1/8 inch thick between two sheets of floured parchment, dusting dough with flour as needed. Cut shapes with heart-shaped cookie cutter. 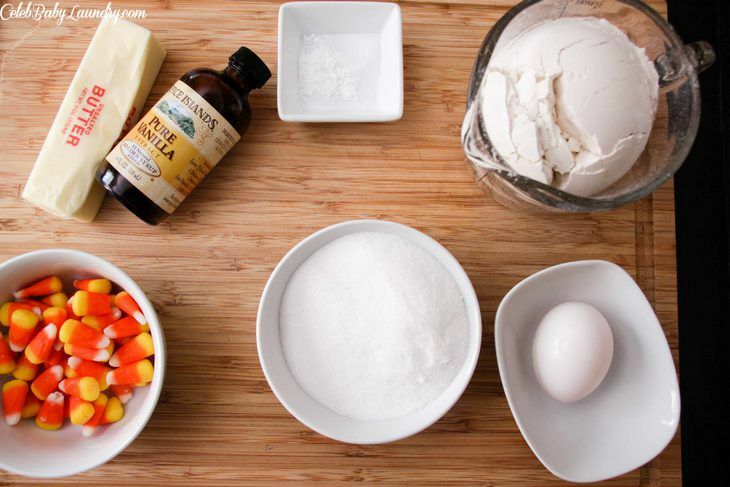 Press a single candy corn into each cookie. Using a spatula, transfer to prepared baking sheets. (If dough gets soft, chill 10 minutes.) Reroll scraps; cut shapes. Repeat with remaining dough. 3. Bake, rotating halfway through, until edges are golden, 10 to 18 minutes (depending on size). Cool completely on wire racks. 4. Chop the chocolate into small pieces. Combine chocolate with room temperature butter in the top of a double boiler, over simmering water. Or if you don’t have a double boiler place a smaller pot inside of a larger pot with water. Stir frequently until melted and smooth. Remove from heat. 5. When cookies are cool enough to handle, dip each cookie into warm dark chocolate and place on tray. Sprinkle with candy corn sprinkles. Get the kids involved in helping you make these cookies for warm memories to go with your sugary treats! Just make sure to have a parent help with the stove and oven. So You Think You Can Dance Host Cat Deeley And Husband Patrick Kielty Announce Pregnancy: Baby Number One!